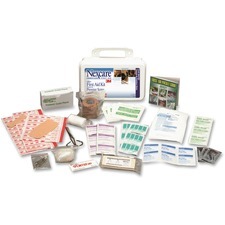 A broad range of bandages, swabs and dressings suitable for most small office or home needs. 174 pieces/kit. 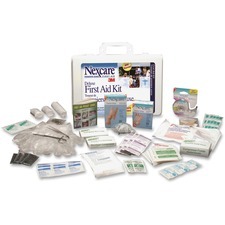 A broad range of bandages, swabs and dressings suitable for most small office or home needs. 64 pieces/kit. Cover the eye in case of laceration, burns or other injuries. 2-1/2" x 1-3/4".5/box. Used to maintain a compress in place. 4"W x 30&apos;L.
4-ply gauze used to clean closed wounds or reinforce dressings, where sterile pads are not required. 2" x 2".200/box. Helps keep bandages and splints in place. Breathable, hypoallergenic and latex free. Transporous - Plastic.1"W x 30&apos;L.
Helps keep bandages and splints in place. Breathable, hypoallergenic and latex free. Microporous - Paper.1"W x 30&apos;L.